When you brush your teeth, do you notice blood coming from your gum line? If so, you probably associate it to pressing too hard. While this can sometimes be the cause of the issue, you may actually have a more severe complication lingering in your mouth. Often the first symptom of gum disease involves bleeding gums. It is estimated that more than half of adults currently have this infection. If you do not take immediate action, it can lead to serious complications with your oral and overall health. If you see any blood while brushing or flossing, it is time to seek treatment for gum disease in Long Island City. Brushing too hard or using a hard-bristled toothbrush can cause your gums to bleed; however, it can also be due to your diet. Foods that contain large amounts of sugars will cause an accumulation of plaque and tartar around the gum line, which increases the risk for gum disease. If you have poor oral hygiene habits, like not flossing regularly, the buildup will not be removed, further raising your risk for the infection. 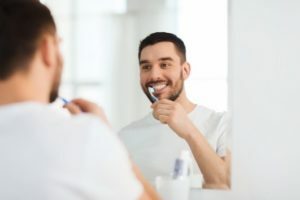 When the plaque and tartar accumulations are not removed habitually through your home oral hygiene routine and preventive care from your dentist in Long Island City, it becomes the perfect breeding ground for bacteria. It will then infect the gum tissue, causing it to become red, inflamed, and irritated. As this occurs, your gums may start to bleed while you may notice other symptoms as well, such as bad breath, tooth sensitivity, and tenderness. How Can I Stop the Bleeding? If your gums are bleeding, you may have the first stage of gum disease, known as gingivitis. With prompt care from your dentist and changes to your home oral hygiene routine, the infection can be stopped without causing any long-term damage. However, if you do not seek treatment right away, it will begin to destroy the supporting structures of the teeth. Over time, this can lead to tooth loss. Not to mention, the bacteria can enter the bloodstream, causing overall health issues, like cardiovascular disease. If you have noticed that your gums are bleeding when you brush your teeth, it is best to schedule an appointment with your dentist as soon as possible. With quick intervention and a customized treatment plan, your gum health will be restored to protect your beautiful smile. At LIC Dental Associates, we focus on providing comprehensive, personalized care that caters to each patient. Due to the skills and qualifications of our dental team, we provide an array of services, including the treatment of advanced issues like periodontal disease. If you suspect that you may have the infection, please contact our office to schedule a consultation. We will restore your gum health to promote a lifelong beautiful smile.